she sent me this photo of her pennon in process, her stitching is divine! Liz is such a rare treasure I truly hope we will get to meet in real life one day! I would like to meet you both. (((Dana))) we need a Matter Transfer Unit! not only the actual results, but the feelings in the making are such gifts! We are time traveling here and now ! Such lovely work. all beautiful Mo – all so beautiful you and Liz and the pins and the pennants and the fabric and the stitching – oh oh so beautiful. Mo – Your words have always encouraged me … your art has likewise inspired me. Thank you for your presence on the other side of the world … even if we never meet in “real life” I will forever consider you a dear friend and mentor. 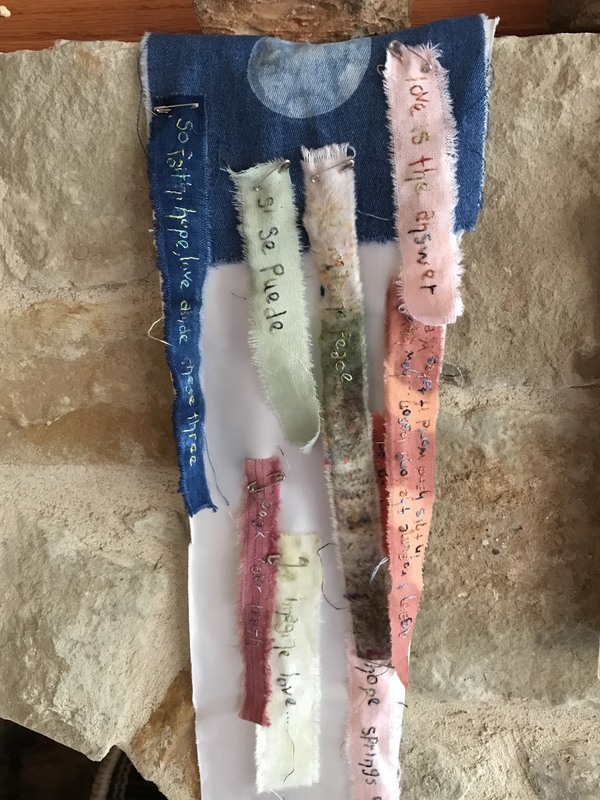 Liz’s beautifully creative thoughtful way of stitching words, choosing the threads for each cloth strip not only inspires but also flows so organically and in so doing, the threads, the words, the cloth strips are becoming heart strings wrapping around the world, giving and connecting us with hope and love. lovely progress and connections… the internet proves how substance can be spun through image and word… cyber “friends” do not belong in quotes! Liz is truly a treasure. I have been blessed with the privilege of spending some invaluable time in her presence. A gracious lady, as you. kindred spirit across the world- at the moment listening ( audio book) to 84 Charing Cross Road about books but also kindred spirits and maybe that is part of the answer. It is very reassuring in our dangerous ,violent times to find generous, kind, peace loving people who want to make things better. 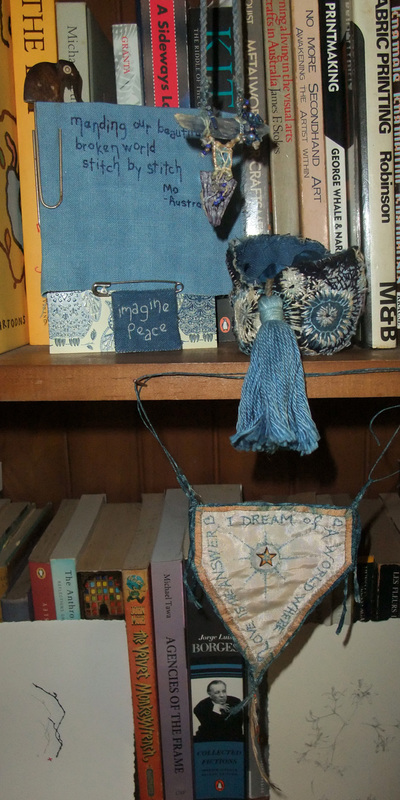 just love her work, I received my imagine peace pin today, she said it was stitched on a piece of dyed cloth form you. love hearing about the stirrings!